Taxpayers file suit against ISD 709 & Johnson Controls Inc.
Five Duluth School District taxpayers have filed suit against Independent School District 709 and Johnson Controls Inc. asserting that the contract between these parties to implement the Red Plan violates state laws requiring local units of government to abide by their competitive bidding policies on major contracts. The Red Plan’s implementation cost has been estimated at $300 million. The taxpayer/plaintiffs request that if the contract is found to be unlawful that the court order a stop to the Red Plan’s construction and order a return of funds improperly received by Johnson Controls. If this is the finding of the court it could result in damages being assessed against the individual school board members who have been responsible for losses to the taxpayers. The five plaintiffs are Harry Welty, Lawrence Burda, Art Johnson, Robert Sershon and Dean Davidson. The first four have been associated with Let Duluth Vote whose calls for a referendum on the Red Plan and/or the consideration of a compromise plan have been repeatedly rebuffed by the Duluth School Board. 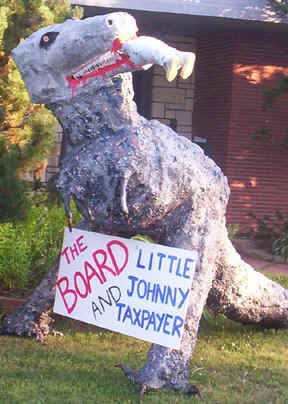 Let Duluth Vote itself has no standing in court because it does not pay property taxes but the plaintiffs are all aggrieved taxpayers who can challenge the legality of the contract for the Red Plan. Attorney Craig Hunter of Northland Law is representing the plaintiffs in their suit. Plaintiffs will hold four informational meetings open to the public this week to explain the suit. Meetings will be held at the Duluth Heights Community Club two blocks north of Central Entrance near its intersection with Arlington Avenue at 6 and 7:30 PM on Tuesday and Thursday. Other school district taxpayers are welcome to join as additional plaintiffs in the suit. 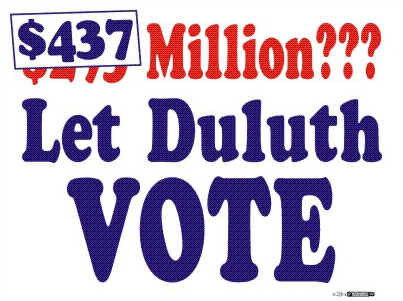 The legal expenses for the plaintiffs are being paid for by Let Duluth Vote which has raised over $30,000 from 2,000 Duluth residents since December of 2008. 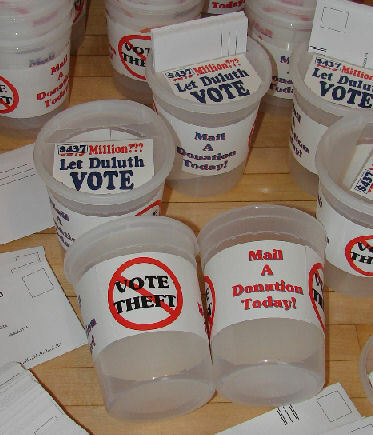 Because Let Duluth Vote anticipates additional legal challenges to the Red Plan and because ISD 709 and Johnson Controls, are expected to appeal a loss in District Court, Let Duluth Vote will continue soliciting donations.